There is no shortage of headlining hoops heroes from the Washington, D.C., area, but the heightened basketball culture as well as financial restrictions have contributed to today’s nullification of our inner-city youth baseball leagues. Over Memorial Day weekend in 2008, I watched — in the front row of the newest addition to the neighborhood, Nationals Park — St. Albans School win the first of three consecutive D.C. High School Baseball Classics. I was excited to see my fellow Bulldogs win a city championship, including two future major league players competing that day. But neither Danny Hultzen, most recently of the Seattle Mariners, nor Matt Bowman of the St. Louis Cardinals is black. I’ve rarely seen black athletes playing baseball in my city, with a few exceptions, and the same is true throughout the entire game. Normally, sports arenas are familiar grounds for black men across the country, and we play not only because we enjoy the game but also because for some — not all — of us, it’s a way out of bad neighborhoods and impoverished situations when we’re young. Some kids have to play ball so they don’t succumb to the target on our backs from racial prejudice and inequities in modern-day society. But unlike many ages ago, baseball is one sport that has become unfamiliar territory to our youths, especially in this city. In the Washington, D.C., area, the presence of baseball is slim to none, with some high schools barely able to field programs, and for a while it was essentially nonexistent, according to Lyndon DeBellotte of Kids First Basketball Inc.
“Back in the day when the Washington Senators left the city, baseball died down and there was no more so-called baseball heroes anymore,” he said. Washington Nationals fans look on before a baseball game against the Colorado Rockies. DeBellotte, who idolized black figures such as Chuck Hinton of the Senators as a kid growing up in D.C., has noticed a push for the sport recently in certain neighborhoods that are lacking black children. “You got Stoddert [Elementary School] up there in Northwest with a hell of a league, but in the inner city, baseball has died down,” he said. The diminishing of baseball has only amplified the effect of the ubiquitous hoops scene in D.C., Maryland and Virginia. Ron Bailey, co-director of the basketball summer league at District of Columbia Interscholastic Athletic Association power Theodore Roosevelt High School, grew up in Largo, Maryland, and has no recollection of it being any different. It’s safe to say that it is a basketball place, with two of the NBA’s most-talked-about players, 2017 No. 1 overall draft pick Markelle Fultz and 2017 NBA Finals MVP and former league MVP Kevin Durant, hailing from Prince George’s County. Maryland has some of the NBA’s brightest stars, sends players to the collegiate ranks each year and has the highest percentage of Division I ballers since 2013. The area has produced many faces of the sport, dating all the way to Elgin Baylor, who starred at Spingarn and went on to have a Hall of Fame career with the Los Angeles Lakers. Southwest D.C. community activist and little league coach Paul Taylor, at a quick glance, could appear to be yet another D.C. hoops legend who was raised in the district like Baylor. Taylor — who stands 6-foot-6 and often rocks his signature Bulgari shades and basketball shorts, or an Adidas jumpsuit — said baseball was actually his first love growing up in Southwest D.C. Taylor, whom they call “Coach South,” attributes kids becoming uninterested in baseball to the lack of coverage in the mainstream media. 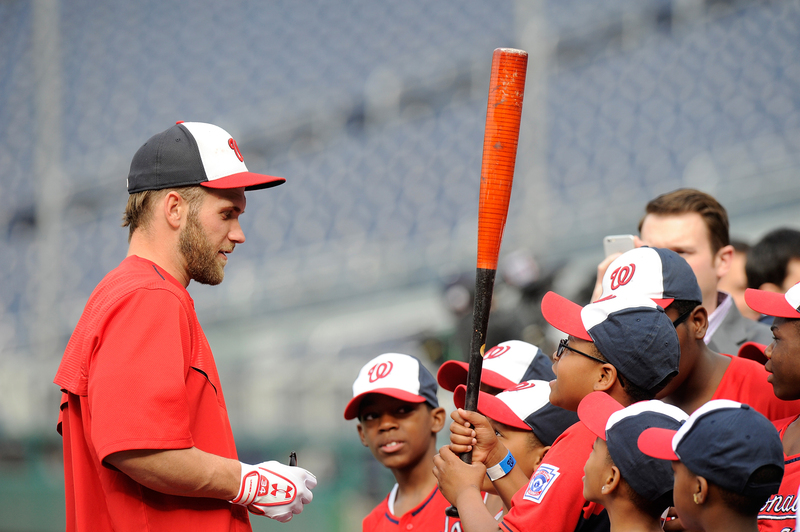 Bryce Harper of the Washington Nationals talks with fans before the game against the Philadelphia Phillies. Youth basketball, especially the AAU market, is an entire conglomerate that has shoe contracts and sponsorships funding the next Markelle Fultz, according to Bailey, who is also the publisher of i95ballerz and Hoya Report.com through Rivals. The next Ripken or even the next Ken Griffey Jr. could be in our local community, but there are few leagues and opportunities offered in the inner city. The D.C. Department of Recreation stops funding for baseball after Little League 8 and under, and because of the ample amount of equipment and fees to play the sport, there is a drop-off in participation among struggling families. South has dealt with inner-city families who find the cost of the sport to be particularly problematic without the extra sponsorship offered for basketball. Some need scholarships to play in area leagues. Shonte Pearson of Southwest D.C. said her son Chauncey has played in the Capitol Hill Little League on full scholarship for three years now. Without the assistance, she wouldn’t be able to keep her son in baseball. Little League hopefuls in low-income black neighborhoods, like parts of Southwest, are put at a disadvantage by the time they reach 8 years old. The black kids attempting to play in baseball travel leagues are as well, according to Bailey. This segregation in the game reminds me of the movie Hardball, truly an unsung sports film, about black boys from the projects of Chicago coming together and overcoming life in the ’hood by playing baseball. The movie reaches many in our community far greater than any picture about the Sultan of Swat and is a testament to all-black inner-city teams. It seems like baseball doesn’t have that same influence over black culture in the District, so perhaps it is just a Midwestern thing. Although my hometown, formerly known as Chocolate City, has a storied history of producing blue-chip basketball recruits, contrary to popular belief, it’s currently baseball season. 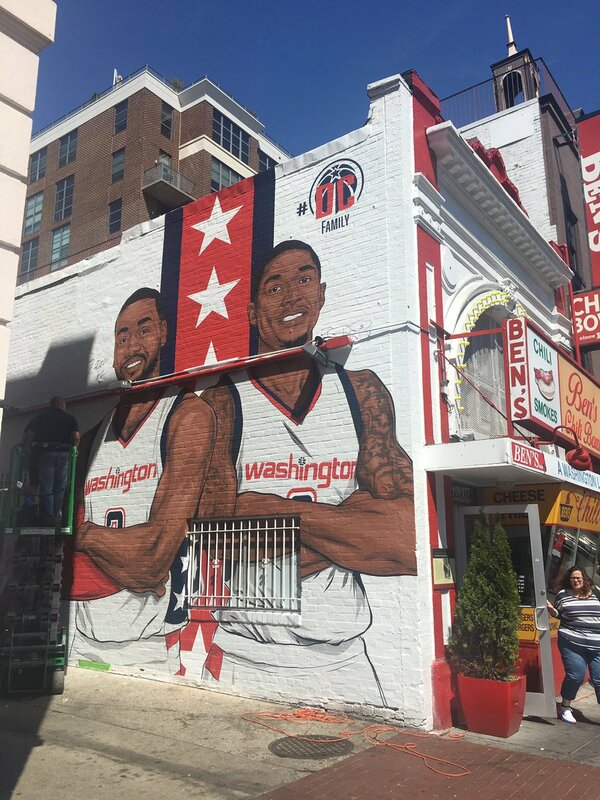 Not Bradley Beal or John Wall, but base … ball. We are the minority in this profession by a substantial amount, and the numbers are dwindling because of a few consequential factors, including a void in coaches and funding from community members in the inner city. Ricardo Doren of the Recreation Department agrees that it will take more of a push from volunteers to coach. “It’s a lot of kids in the city that can play, and would be good at baseball if somebody who played the sport and loves it wants to teach it,” he said. Thankfully, the Washington Nationals Youth Baseball Academy, founded in 2014, is one of the city’s shining lights, with a mission dedicated to helping teach D.C. kids both on and off the field, according to executive director Tal Alter. “The goal of the academy is to use baseball as a vehicle for the lessons that are so vital for success in life, and coupling that with tangible skill-building, academics and even health holistically,” he said. The academy, backed by the MLB-MLBPA’s Youth Development Foundation with joint funding from both the union and commissioner’s office, launched YBA Play Summer League in 2016, a free league that has a five-year plan of expanding its outreach to children across the city. Right now it includes roughly 300 kids ages 6-12 from Wards 6-8, and it projects that it will multiply to 1,600 youths by the summer of 2021, Alter confirmed. The D.C. Little League divisional championship featured one 12-and-under team composed of an all-black club that included seven of its 11 members who first learned how to play baseball primarily at the academy, according to Alter. 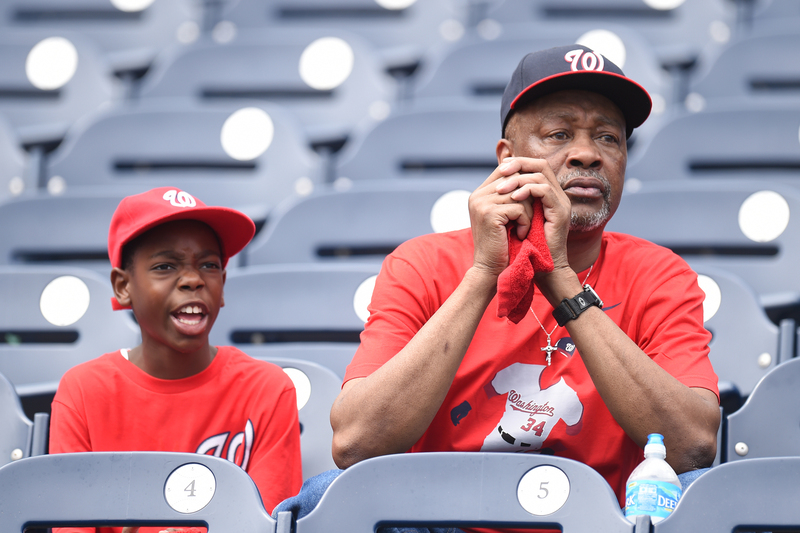 The youth programs such as the academy have made small strides to bring baseball back, but it will indeed take the whole village to raise D.C.’s children. Unfortunately, the academy’s current efforts may not be enough to succeed in combating where we are now.